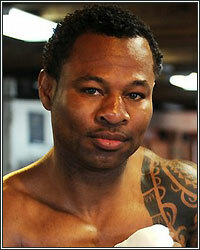 SHANE MOSLEY: "FREDDIE'S NERVOUS ABOUT THIS FIGHT"
"I can be better than I was when I fought Margarito. I can be better than that and they're not understanding that at all. They don't know what they've done. Wow! God works in mysterious ways. They messed up. I can't wait...Freddie's nervous right now about this fight. He's nervous," stated three-division world champion "Sugar" Shane Mosley as he talked about his upcoming training camp for his May 7th showdown with Manny Pacquiao. Check it out! BT: It looks like Freddie is going to bring in Shawn Porter to help Manny in sparring. Some people say he fights a lot like you. SM: Oh yeah? That's why they're bringing him in there, huh? Hey, let 'em have him in there. That's fine. It ain't going to be the same thing though. It's going to be worse because I'm going to be ready. Man, I'm already ready. I'm going to be ready ready. BT: I don't think I realized how much shorter Manny is than you until I saw some pictures from a photo shoot where they had him standing on a block next to you. SM: Yeah. His legs are big, but his body is small. His body's not that big. His body is real small and compact. Even when I like stepped up to him, I was like damn. His shoulders and...he's just little. He tricks people because he generates his power from his legs, but his frame is small. If you hit him in his frame real good, man. That's why Margarito was able to hurt him like that, because he hit him on his little frame. BT: Marquez and Morales also hurt him to the body. I don't think they realized it, but they both caught him with good body shots that he did not like at all; and those guys are small. SM: He has a small body. When he ripped it all up, it's real small. If you look at both of our upper bodies, it's a total difference. He gets his power from his legs though. That's why people look at him and say, "Man, this guy is little. He's got a little frame and little everything." But they gotta look at his legs. BT: Yeah, he got tree trunks for legs. SM: He's got big legs. That's where a lot of his power is generated. He's got small arms too. If you look at arms, there's a picture of us where he's standing regular and I'm standing regular. My arms go to as long as his arms, my fingertips to his fingertips, but I'm like 2 or 3 inches taller than him, so my arms are a lot longer than his; a lot longer. I'm like whoooooa. I have so many advantages on him that it's ridiculous. They don't even understand what they've done. I mean, you know, when he fought Cotto, Cotto's arms are kind of short; he does alright with them, but they're not longer than Pacquiao. Margaritos arms are about the same and he was able to hit Pacquiao a lot. Man, I don't know if they understand what they just did [by making this fight]. BT: Well that's because they're banking on the notion that your last two performances are a sign that you're shot and ripe for the taking. Two years ago, Freddie made it clear that he didn't want Manny to fight you because he felt you were still too dangerous. SM: I know, but the thing is, I can be better than I was when I fought Margarito. I can be better than that and they're not understanding that at all. They don't know what they've done. Wow! God works in mysterious ways. They messed up. I can't wait. BT: So when are you going into camp? SM: Man, I'm already in Big Bear. I mean, you know, I'm not training training, but just doing my little side stuff. Some of the boys are up there working with me and I'm working with my son, just kinda hitting the bag. I don't have any southpaws up there right now, but I'm just keeping myself in good shape. When Brother Naaz comes in, boom, I'll be in pretty good shape and then I'll be able to go through all the drills that I need to do. BT: Is there going to be an issue with Brother Naaz if Hopkins has that rematch with Pascal in May? Is he going to have to split time between camps at all? SM: Nah, Brother Naaz already told Bernard that he's going to be up in Big Bear, so Bernard will probably be up in Big Bear with us. Philly's going to be cold and most likely, he'll like Big Bear anyway so he might as well come to Big Bear. Brother Naaz said he's going to be up there in Big Bear to start training me on the first of March, so I only assume that Bernard Hopkins will be following him. BT: That's good. I know Brother Naaz was pulling triple duty between yourself, Steve Cunningham and Bernard when you were training for the Mayweather fight. It sounds like everything will be in place for you to have an uninterrupted camp for one of the biggest fights of your career. SM: Yeah, they just messed up. They're underestimating me. They're underestimating me in a real way and it's just like, man, y'all messed up. BT: Well, like I said, Freddie wasn't so eager to make the fight until he saw your last two performances against guys who make everyone they fight look ugly in their own way. SM: He said no before already. Freddie's nervous right now about this fight. He's nervous. He's like, "Manny, come on, we gotta train, we gotta train." Manny's like, "Yeah, yeah, yeah, I'm gonna got to the Philippines for a month. I'll come back for the last month. We'll be alright." He's like, "Yeah, yeah, yeah, Freddie, don't worry about it. I'll go up there and train, get myself in shape, and then we'll come back and work on strategy a month before the fight. I'll be ready. Don't worry about it." Oh boy. Big mistake. I'm just happy I got this opportunity to be able to do this. I mean, people are going to be like, "How did he do that?" They're going to be baffled.